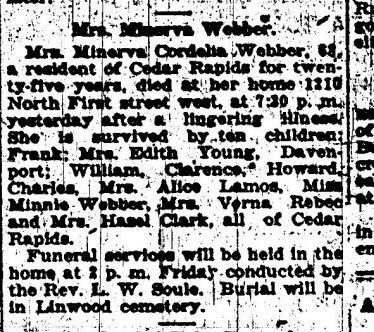 I have cemetery records of some of my WEBBERS, AS WELL AS SOME OBITS COPIED FROM THE NEWSPAPER back in the 1900's [see below]. James H. WEBBER was a well-known, respected Brick Mason back then before his accidental death. 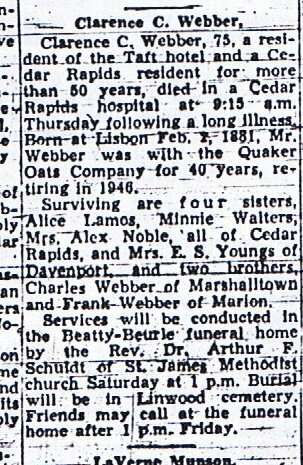 Sadly, his son's daughter, my grandmother, Hazel Vivian Webber, married my grandfather. He placed her in Iowa State Hospital (Isolation) for having either a nervous breakdown or getting sick at a party they were at. She died there in 1942 at the young age of 24. She had two infant children she loved. She was buried in a COUNTY cemetery, all alone. I believe she was considered an outcast or black sheep of the family. My grandfather was Filipino. How hard it must have been on her trying to keep in touch with her white family! She is laid to rest in Black Hawk County Cemetery. She was born in Cedar Rapids, Linn County. I have no pictures of my Webber Family. I have one picture of Hazel, my grandmother, with my father, her infant son. My aunt was born while my grandmother was in that hospital. I don't know if she was actual born AT the hospital, or if they took her to another hospital for her to be born. My dad and aunt were placed in an orphanage by my grandfather. My grandfather owned a restaurant in Black Hawk County. He stayed in contact with his children. They eventually were taken care of by a wonderful foster family, who still keep in touch with him to this day. They were farmers. 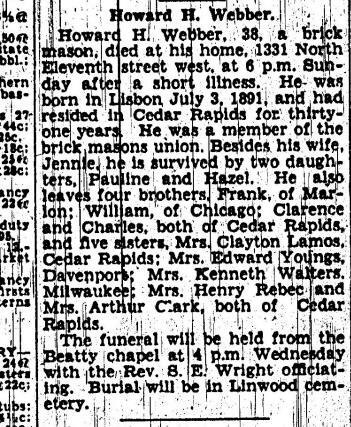 Obituaries from Cedar Rapids Gazette. James H. Webber, 7-23-1913 dies after accidental fall during his visit with fellow brick masons while sitting on wall. He was a well-known brick mason. 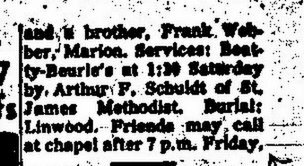 Howard Paul Webber, 2-23-1930, from complications with pneumonia.